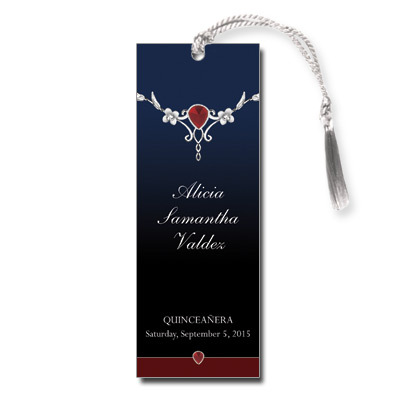 Red, navy blue and silver combine with an image of a silver and ruby necklace in this victorian-inspired Quinceanera keepsake. With colors that are reminiscent of twilight, this bookmark is perfect for a midnight garden or even vampire themed party. Your child's name is printed in script at the top for added elegance, with personalized event information below. Bookmark measures 2x5.5 and comes with white tassels; light assembly required.